Can the small town of Bindarra Creek erase the demons from his past and help him find love and forgiveness? Struggling to come to terms with the guilt of his younger brother’s death, Mac Stafford heads to the country for solitude. Hopefully, the small town of Bindarra Creek will offer the peace he craves. However, nothing keeps the demons away at night. After being summoned home to Bindarra Creek, Brooke Fairfax finds herself instantly attracted to the town’s new mechanic. Her feelings deepen when Mac shows a kindness to Brooke’s younger brother who is a Down syndrome child. When she discovers Mac has lied and didn’t confided in her with the truth, her trust in him is shattered. I quite enjoyed the story line, but I was annoyed at the lack of proof reading. There are quite a number of errors which distracted me. The author had obviously changed the sentence without removing all the incorrect altered text. Also a number of spelling errors. A lovely storyline, well-drawn characters, and a delightful touch on the character of young Davey. This book has an amazing push-pull happening between the main characters, tugging the reader along, asking whether there will indeed be a Happy Ever After for these two unlikely people. I loved the story of Mac and Brooke, and really enjoyed this addition to the Bindarra Creek Romance series. This was a great read. I have enjoyed all the books in the Bindarra Creek series and this one was no exception. It was well crafted and entertaining and I look forward to reading all the books. A great a read just like the rest of the serious once again jealousy and money are the root of all evil. Desperately needs proof reading. No respect for the reader when a writer cannot be bothered to proof read and edit. I am giving this book 5 stars because I simply loved the storyline. I enjoyed getting to know Mac and Brooke - the main characters, and found a soft spot for Davey, Brooke's little brother, who has Downs syndrome. I think the author handled this special character with love and compassion and a touch of humour. 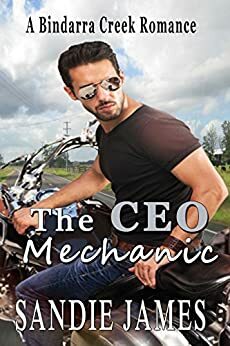 The CEO mechanic was one of those reads I really didn't want to put down till I'd finished it. Well done Sandie James!